My grandfather died of Alzheimer’s disease, so whenever I see an article written about it I usually read it. I was looking at the World Tea News when I saw an article about white tea and Alzheimer’s. I had to read it. There is evidence that white tea with its polyphenols helps suppress neurotoxicity and neurodegeneration. White tea is suggested because it has higher catechins and stronger antioxidant potential than other teas, including green tea. This must be because it is the least processed tea, it is literally freshly plucked tea that is dried and that is it. The article also mentioned a study where white tea helped restore glucose tolerance and insulin sensitivity of prediabetic rats and was hopeful it would the same with prediabetic people. 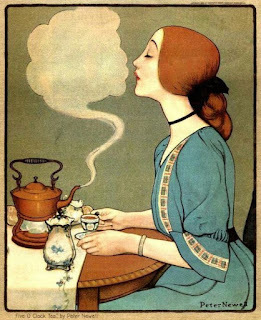 As mentioned before tea in any form is not the end all be all, but if you have any of the conditions you may want to consider drinking a cup of white tea a day to help with your condition as long as it does not interfere with the drugs you may be already taking. Like most things getting the nutritional value it is best to get from the natural source. Vitamin A and C work best and absorb better when you get it from sweet potatoes and oranges or other similar sources. Same with the catechins in green tea, though it seems the supplements are actually too powerful, unlike vitamin supplements. Vitamin supplements tend to not be as good as the fruit or vegetables. Nowhere in the article is it saying that the catechins and EGCG’s are not good, but that green tea extracts tend to be too powerful. This is great news for anyone in the tea brewing business. A toast to drinking green tea and other teas too. It is good for you and tasty too. This post will only be minimally tea related. I hope everyone is able to be with family and/or friends today. I hope you eat a little too much. Today is a day to forget about diets, you can always renew your diet Friday. Today is the day to enjoy with the people you care about the most. I have a 20% off sale going on now and until December 2nd, 2017 on Etsy. I hope you wait until either Black Friday, Small Business Saturday or Cyber Monday to order because today I will not process any order (this is actually scheduled so I may not even use the internet). Portage WI 53901 from 10 am to 4 pm. If you are in the area, stop by and shop. On Tuesday, November 28, 2017, I am proud to be a part of the #GivingTuesday. I will donate a soup for 6 people for the Friends of the Community Gardens. I will either show the winner how to make 1 of the 3 soups choices or make that soup for you and deliver it. I believe everyone should have access to healthy food. Community gardens allow people to have a garden for a very low cost. Please donate to this worthy cause. On Friday 17, 2017 I was lucky enough to be invited to hear Oscar Brekell speak about Japanese green tea at the Ivy Room in Chicago. Been invited to these events since 2012. Always learn so much about various Japanese products like saki, sushi, and other Japanese delicacies. This time it was hearing Oscar Brekell, certified as a Nihoncha Japanese Tea Instructor, talk about Japanese green tea. Only 7 non-Japanese have this designation, so this was a true honor. He was knowledgeable and had a great sense of humor. Oscar learned about Japanese green teas from planting to the final product of different Japanese green teas. Some of the green teas he mentioned are not exported, so the only way you know about them is to visit Japan. I was also able to try a product that cost at least $250 a bottle (wine bottle size). It was tasty and well balanced. So I have been having fun with coming up with some teas and tisanes. I have a few new ones recently. One that went well at my two last events was Autumn Spice. I sold out of at both events. The first event I actually sold out of 7 of my blends, so I felt obligated to drive back to Green Bay and make more bags. I felt odd being at an event with a good portion of my teas and tisanes not available. If I just sold out of 2 or maybe even 3 of them I might not have gone back home. So instead of relaxing with a nice meal in Bayview and maybe a drink or two, which was what I wanted to do, I went back home. I do not regret it at all and am to make sure I am supplied for my customers. Cat Nap sold out at the first event and the only tisane I did not bring to the second event because I needed to blend it and that would have taken too long. I blended it recently, so I do have it again. Two new, temporary tisanes made were Cinnamon Plum and Lemon Blueberry Rooibos (below). They are only available at the events I am doing and the next three are Tis the Season Vendor & Craft Event Nov 18, The Small Business Saturday Nov 25, and Christmas at the Railyard Dec 2. I am doing this in limited quantities while supplies last. They may or may not return, so get them before they are gone. Some more good news about green tea becoming more popular. Found this article about a week or two ago in the World Tea News. They have many articles about the tea industry, sometimes good, sometimes so-so, and sometimes bad. The main goal is to be accurate about various aspects of the tea industry. I have been lucky to have subscribed to this newsletter for over a dozen years. Learning trends and sometimes strifes that happen in areas of the tea growing world. It was nice to read an article that was predominately giving good news for my industry. As a lover of Japanese green teas, I really like reading this article. Not only does Japanese green tea taste good to me and it is a very healthy beverage too. Right now I only have 2 Japanese green teas: Sencha and Genmaicha, but can get special orders of almost any green tea from Japan. It may take awhile, but it is doable. I am waiting for my business to pick up a little before I do several grades of matcha tea. The photo below is Sencha tea. Chinese style green tea is also very healthy and tasty too. Some people prefer one over the other, so choose the one you like the most. Be happy that you are enjoying a tasty beverage that is increasing in popularity and good for your health. My adventures with this website. Had the lovely marketing company Autumn Hill Creative create my lovely website. Will be adding more things to the web store in Gifts – Tea Time Store. The catering is something that will happen eventually, but not my focus yet. Thank you for visiting my website and blog! P.S. I just noticed that the pictures for each event alternate from horizontal to vertical.